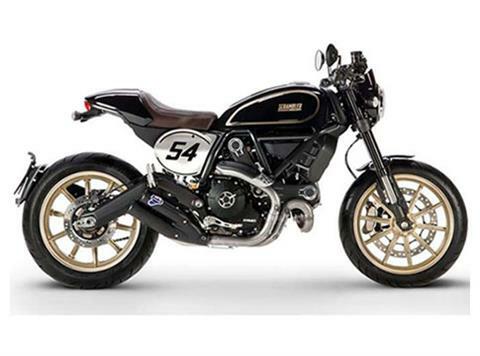 The Ducati Scrambler Cafe Racer, Scrambler's interpretation of the legendary bikes that created a revolution in the motorcycle world, is an expression of free spirit and an emblem of style. Its "Black Coffee" color brings back the 60s to today's Land of Joy. The typical Scrambler teardrop tank with interchangeable panels is combined with a new seat, specially designed and equipped with a seat cover for the passenger. The handlebars with mirrors attached to the ends are typical of 60s racing; the same goes for the Termignoni exhaust with double silencer, the headlight fairing, the side number holders and the new Pirelli Diablo? Rosso II with 17-inch aluminum wheels. The styling is a clear reference to the style of the Rockers that in those days sped through the streets of the English capital. The Ducati Scrambler Cafe Racer reinterprets what was one of the most influential movements in the history of motorcycling, recreating a legend with a contemporary character reflecting the essence of the Scrambler. Wet - 188 kg (414 lb) *Kerb weights indicate total bike weight with all operating consumable liquids and a fuel tank filled to 90% of capacity (as per EC standard 93/93).